I’m noticing that something powerful is going on within the HR space. It’s organic. It’s energetic. It feels urgent. It’s about getting HR people more intimately connected with each other. It’s about gaining confidence and strength through closer relationships. And it might be turning the conference world on its ear. HR conferences organized by groups likes SHRM (including SHRM global and its 52 state councils), ASTD, WorldatWork, ERE, LRP and others have done a very strong job of creating traditional conference experiences that provide content, continuing education credits, vendor showcases and limited networking experiences. But well-executed as they are, well-attended as many of them are, and well-marketed as they are, they don’t provide something that seems to be getting more and more valuable to a certain subset of HR leaders: the opportunity to have intimate discussions with thought leaders. And there’s a growing sense of immediacey about what’s missing. So what’s my evidence? Well, first there is HRevolution. An early entrant in the HR “un-conference” space, two HRevolutions have been held and the third is in the planning stages. Organized by Trish McFarlane, Ben Eubanks, Steve Boese and others, this grass roots gathering gets HR folks together to wrestle with each other on topics relating to the relevance of HR. Facilitators lead discussions rather than speakers giving presentations. It’s been given high marks for engaging its attendees, but questions of “what’s next?” persist. The “Tru” un-conferences in Europe appear to be similar to HRevolution in that they have sprung from concerned and committed individuals in the HR space rather than from organizations in the HR space. I’ll know more after attending the TruLondon conference in February. RecruitFest! organized by RecruitingBlogs.com also joined the “un-conference” space, but mixed it up in 2010 with a different approach. Instead of discussion groups, thought-leaders held conversations for the viewing audience (75 in studio; almost 4,000 through the live stream) to listen and watch. It got the thought leader discussion piece right with some engagement of attendees and it also got high marks. But again, “what do I do now?” questions followed. The HRevolution, TruEvents and RecruitFest! unconferences are broad in their reach. They engage interested professionals from all over the world to attend either in person or virtually. Now here’s a new twist: the HR Reinvention Experiment held last Thursday for senior HR leaders in the state of Nebraska. Jason Lauritsen, a senior HR executive in Lincoln asked himself “what’s next?” after attending the last HRevolution. He assembled a small group of like minded business leaders in the HR space in Omaha and Lincoln and they gathered nearly 70 senior leaders from across Nebraska to talk with each other and begin to address challenges in Nebraska that need HR’s leadership. And with the support of several local sponsor organizations, the HR Reinvention Experiment began to take shape. A combination of traditional and un-conference organizing approaches, the HR Reinvention Experiment included tailored keynote presentations (me and Jason Seiden), small group discussions led by true thought leaders (Paul Hebert, Joe Gerstandt, William Tincup and Roger Fransecky) and a couple of traditional “concurrent session” topics (Chris Bryant and Greg Harris). Limited to 75 attendees from a specific geographic area, HRRE was a day full of challenging content, discussion and engagement, all with a local focus. To further underscore its difference from traditional conference approaches, HRRE was held in the open spaces of the Hot Shops Art Center, an art center (and former mattress factory) consisting of working art studios, showrooms and gallery spaces. Attendees, surrounded by the creative process, carried their folding chairs from space to space throughout the day so that gathering spots magically opened up in places like pottery and glass blowing studios as well as galleries. 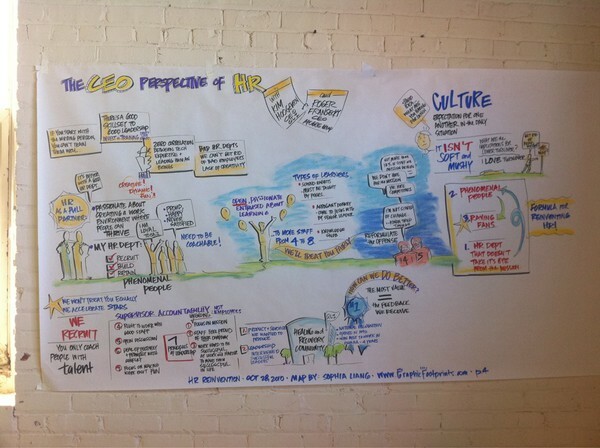 Instead of PowerPoints and handouts, the HRRE organizing team hired the graphic genius of Sophia Liang (Graphic Footprints) to make a graphic recording of the keynote sessions, as well as several of the discussion sessions. This is the recording of the lunch keynote, “The CEO Perspective of HR,” a discussion between two CEOs: Roger Fransecky and Kim Hoogeveen. The additional recordings will be shared on the HRRE website soon. It was a full day to say the least. I participated as the opening keynoter giving the attendees an “HR Wake-Up Call” as well as attending as a participant for the full day’s activities. The experience was challenging, fun, engaging and thought-provoking. It brought together many of Nebraska’s HR leaders for a day of thoughtful and personal engagement and pushed them to ask new questions and assume different outcomes. But while the “what’s next?” question persists, I have a feeling that there will indeed be a “next” in Nebraska. These business leaders seem ready to take action. HRRE felt like a catalyst that will start to move the discussions into action. Time will tell, of course, but the framework exists to launch a new kind of self-driven professional community. Professional organizations catering to HR leaders should be taking note of the grass roots efforts to connect in new and more impactful ways. Whether it’s learning and conferences or advocacy and membership, there are unmet needs that are becoming urgent in the HR world. The frequency and level of innovation happening in this space suggests that the current infrastructure is becoming less relevant to a portion of the population. And this portion of the HR population has the commitment, skills and intellectual curiosity to do something about it. We should all stay tuned…. William: it was a great event — made more thoughtful and impactful by your presence. Can’t wait to do it again some time! Loved the article China. It presents many things that are needed to be taken into consideration for those planning traditional HR conferences. Hopefully, these new trends can be combined into the traditional model to add new and exciting ways to look at a same-old, same-old concept. I know ILSHRM will be looking at some possibilities for our next conference. Hey John. Thanks for reading my blog. I know you’re looking at how to lead IL SHRM next year into greater relevancy. Talking with Jason and members of his team would be a good plan. This truly was a great event!